Restaurants with extensive collections and offerings of wine, as well as liquor stores with enormous wine inventories, will all have a need for appropriate wine storage and display space capabilities. These types of needs call for good commercial wine racks. Such commercial wine racks are ideal for showcasing a selection of wines and choices for customers – customers who are more likely to buy what they can first physically see and touch. 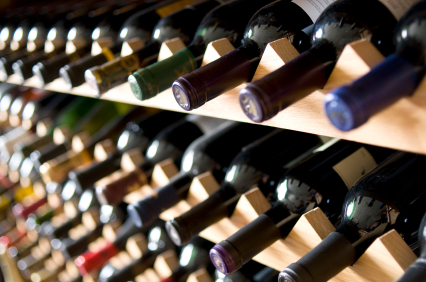 This article covers a variety of factors to consider in seeking out the best commercial wine rack for the businesses’ needs. Ranging widely in material from which they are constructed, design, size, and price, commercial wine racks typically are built to hold literally hundreds of bottles of wine. The first element that a restaurant owner or liquor store owner will need to contemplate when thinking about purchasing a good commercial wine rack concerns the number of wine bottles which will have to be stored and displayed on the wine rack(s). The type of functionality and accessibility required of the (or each) rack will also need to be determined. As an example of the wide variety of factors which need to be considered, there are commercial wine racks built to be easily transported around showcases or restaurants. These come with wheels and a stronger, more durable frame made from steel. Different wine racks come tiered and possess a wine tasting spot on the top. Such wine racks also feature movable tasting tables in the wine rack beneath. There are smaller commercial wine racks which are constructed and intended for display purposes alone. Such racks are usually built from high quality, relatively expensive hardwoods such as redwood. These types of wine racks range in price from only $10 on up to $150. Bigger racks, containing two or even three tiers will run from a steeper $800 on up to $1,500. After the business person decides on the purpose for the commercial wine rack, as well as on the numbers of wine bottles which will be kept there, then he or she is capable of picking out either a functional or a more elegant wine rack which will work appropriately into the budget. True-Radius Curve – A commercial wine rack with a true radius curve gives a corner display rack a modern appearance, like a fine piece of furniture. Toe-Kick – By including an approximately one and a half inch toe kick, the commercial wine rack gains additional stability. Extra protection for any wine bottles stored underneath is also achieved. Hardware – This is an important consideration. Hardware which is entirely invisible better permits the owner and the guest to concentrate on the wine bottles themselves, instead of ugly screws and unattractive screw covers which attempt to hide the ugly screws. Bottle Cubicles – Nothing is worse than a commercial wine rack with holes too small for Champagne bottles or other unusually shaped wine bottles. Good cubicles will be larger, around three and three quarter inches per hole in the rack, to allow these larger and unusually shaped bottles to fit, as well as the majority of 750’s (magnums). Dado Spacer Bars – In order to have a sturdier and stronger final wine rack product, which includes an easier installation process, notched dados are ideal. Such dados should be included on the bottom, top, back, and front of the commercial wine rack. Wood Species – Although commercial wine racks can be built from most types of woods, wood species without any naturally occurring smell, which are inherently decay resistant, are superior for such longer time frame applications as restaurants and liquor stores have in mind. Those wood species which ought to be avoided whatever the cost include Birch, Poplar, and Cedar. Sanding – Angled and triple-sanded bottle supports with easy edges make for a more secure location for your wine bottles that will not risk tearing the bottle labels. Be mindful of sharp bottle supports which are at ninety degree angles. Wood Thickness – Proper commercial wine rack stability is assured by thickness of wood of minimally eleven sixteenth of an inch on both all bottle supports and ladders. This furthermore creates an elegant and current look. Another element to consider in selecting the appropriate commercial wine rack revolves around the rack’s ability to effectively showcase the collection to potential customers. Anyone in the restaurant or wine retail business will be well acquainted with the time tested concept of the customer not being capable of purchasing something which they can not see. This applies to wine bottles, as well. The greater the number of bottle’s labels which the owner is able to front, the more numbers of bottles will find their way to the restaurant’s dinner tables or into the liquor store’s customer shopping carts and baskets. Is there any reason at all why a wine rack should not be as attractive as are the wine bottles and the wine itself? There are a variety of different commercial wine rack styles available. Finer or more common woods may be chosen along with the style. Such woods as premium Redwood or Malaysian Mahogany will obviously cost more. Below are listed several of the more practical and utilized commercial wine rack styles available. Aisles – this style of retailer commercial wine rack sets up an appealing floor plan when the aisle wine racks are placed one next to the other. Such styles of wine racks range from $300 to $1,450, depending on the type of wood chosen. Half-Aisles – smaller half-aisle sized commercial wine racks are ideal for areas of higher traffic like the store or restaurant front, or up by the cash register. They range from $100 to more than $600, depending on the type of wood chosen. Wall Display Wine Racks – these commercial wine racks permit the owner to display his or her bottle labels using the wall mounted concept. Such styles range from $280 to $1,000, depending on the type of wood chosen. Shelves – commercial wine rack shelves are ideal for displaying the owner’s favorite wine bottles. Such styles range from $440 to around $1,200.